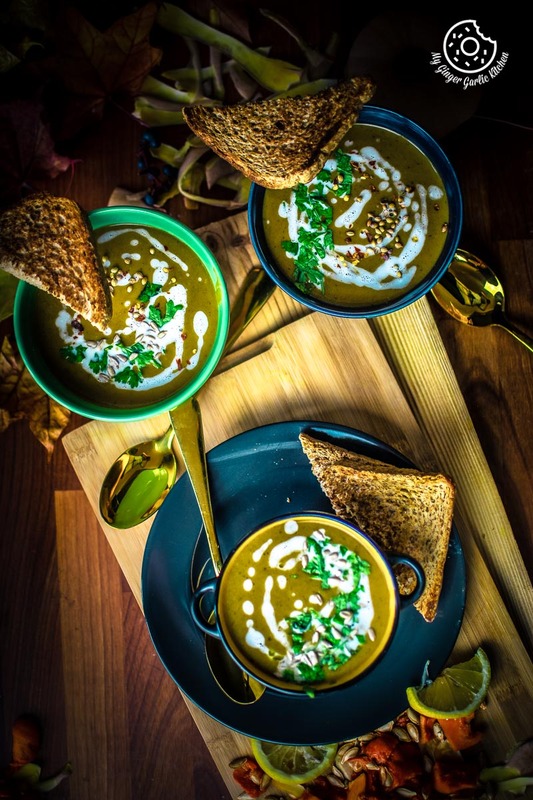 Butternut Squash Soup Recipe with a simple step-by-step video tutorial. 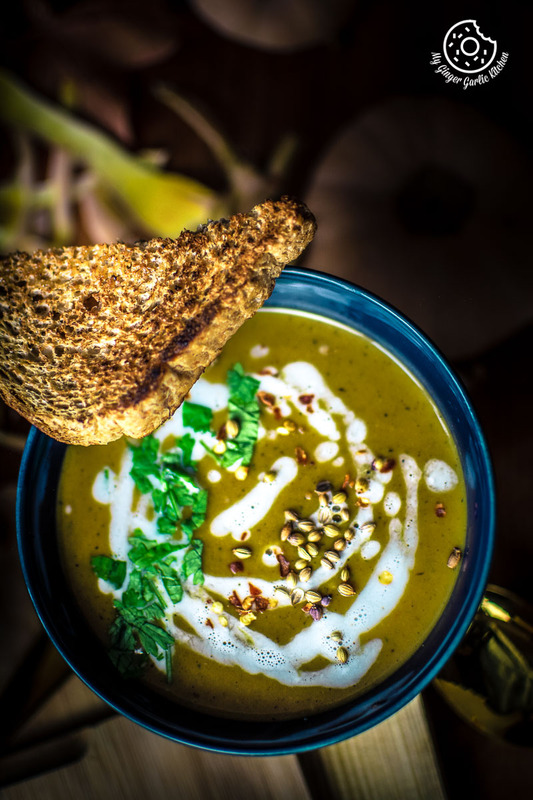 A comfy, rich, creamy, and fall-winter favorite warming bowl of golden butternut squash soup is all you need in this cold and dark month of November. 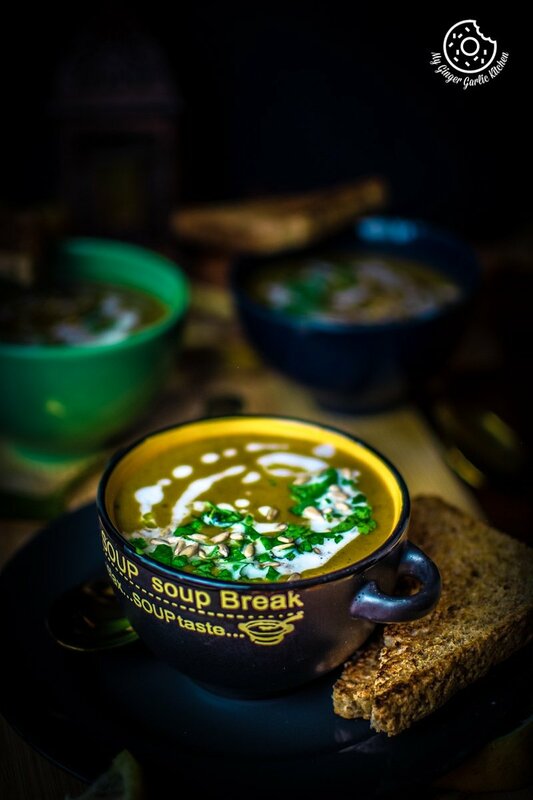 The rich creaminess, the vibrant color, the smooth textures, and yummy flavors, you name it – this soup has everything. 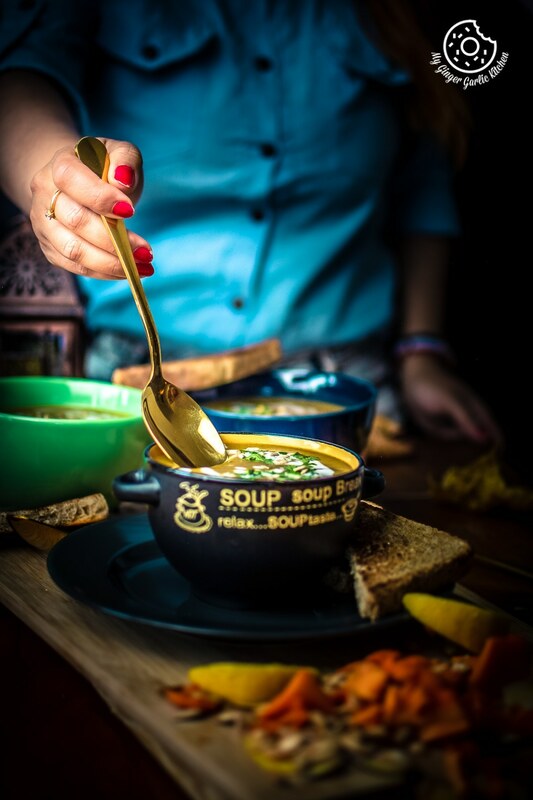 Some fluorescent candles burning, some pumpkin bread, some calming music in the background, a cozy blanket and a warming bowlful of golden, cozy and festive soup in your palms on a cold night is all you need to go on the fall-winter HYGGE mode. In this Butternut Squash Soup recipe, roasted butternut squash gets cooked with some onions, garlic, warming spices, and coconut milk then gets blended into the mix—resulting in a thick, creamy, and rich texture. Fresh coriander leaves and warm spices add just the right amount of zap to the dish. This soup in simple terms, a perfect balance of sweet and mildly spicy seasonal flavors. This deep golden soup is as delightful as it looks. The flavor of garlic is what shines this soup. So feel free to intensify the garlic flavor by adding some extra garlic cloves while roasting your butternut. This comfort food is warm and creamy, without any cream. This super easy to make, rich-tasting, astonishingly cozy and delightful soup is my all-time favorite. You start by peeling the butternut squash and cutting it in half widthwise. Then you deseed it and cut into cubes. Add garlic cloves, olive oil, salt, and pepper. Toss it well and roast it in a hot oven. Sauté garlic, yellow onion, fresh coriander leaves, spices, and vegetable broth. Add roasted butternut squash and coconut milk. When everything’s cooked and the flavors have merged, purée it in the blender. Cook it for 7-8 minutes. Done. How to store Butternut Squash Soup? Let the soup completely cool down to the room temperature. Transfer it in a container and cover it. You can refrigerate for up to 3 days. If you want to freeze it, then put it into a freezer safe container and freeze. Thaw it a room temperature and heat it up before serving. To spruce up the flavor and make it taste fresher, add some coriander leaves, and some coconut cream while heating it up. The soup thickens as it cools and so you may need to add some broth or water when reheating. Thanksgiving is around the corner, and this creamless super creamy roasted butternut squash soup recipe is a great make-ahead option. This soup would go well with any Thanksgiving meal. This soup is made with a few simple Ingredients. In this soup recipe, butternut squash is the star ingredient. All you’ll need is butternut squash, olive oil, yellow onion, garlic, vegetable broth, coconut milk, some cinnamon powder, cumin powder, cayenne pepper, curry powder, salt, and pepper. As a result, you will get an unexpectedly rich flavored soup. Roasted Butternut Brings In An Awesome Flavor. Roasting butternut squash caramelizes its sweet flavors in the best way possible. Plus, it doesn’t take a long time to cook the soup when you roast the squash. Once the squash is half roasted, you can start sautéing some onions and garlic. This would make the process faster. Feel Free To Garnish it the way you like. This soup is pretty and tasty in itself and doesn’t require any garnishing. But going a step further makes food really pleasing. So feel free to add a sprinkle of freshly ground black pepper, some chili flakes for that extra visual appeal. I like to drizzle my soup with some extra coconut milk, some cilantro leaves, and toasted sunflower seeds. Cheese: You can top it with some goat cheese, cheddar cheese, cottage cheese or crumbled feta. Nuts: You can top this soup with some toasted almonds, toasted cashews, walnuts, sunflower seeds, pumpkin seeds, or coconut chips. Herbs: You can add fresh cilantro, sage, or thyme. Chewy-texture: To add some extra chewiness to your soup, you can top it with some cooked rice, noodles, quinoa, or any of your favorite grains. How to perfectly blend butternut squash soup? You can use an immersion blender and blend the soup in the pot itself until it is super creamy. This way things are easier because then you don’t have to be careful to transfer hot soup to a blender and blend it in batches. Blend it for a couple of minutes, that’s the way to get the super-smooth results. Is this butternut squash soup vegan? Yes, this easy peasy Butternut Squash Soup recipe is naturally gluten-free and vegan. Instead of vegetable stock, you can also use chicken broth or even plain water. If you want to make it richer, then you can also add some whipped cream cheese to this soup. If you have guests coming over, you can make it a day before, and reheat it in your pot on the stove when they arrive. 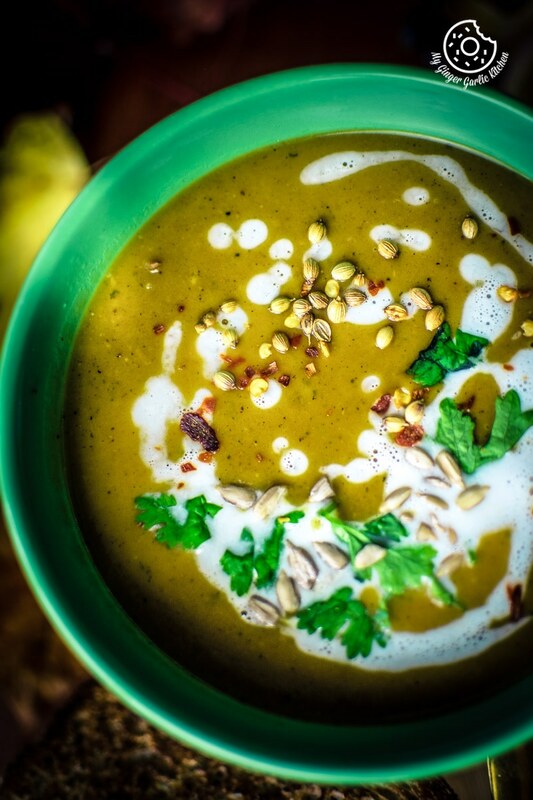 You can also add 1 tablespoon Thai curry paste to make it Thai Curry Butternut Squash soup. You can use replace coconut milk with cashew milk + cream. You can also add some ginger to the soup while sautéeing. For buttery flavor, you can swap olive oil with butter. This soup recipe is delicious, healthy, and easy to follow. 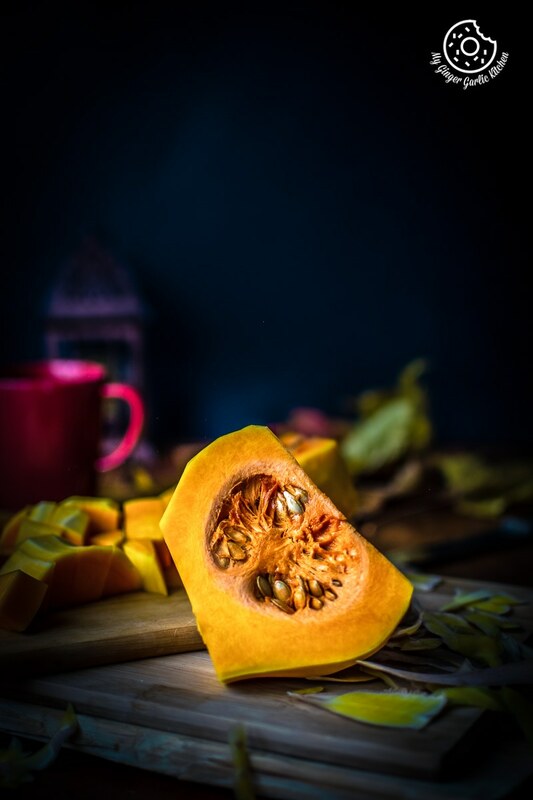 Make it for your family, and this delicious winter squash soup will be one of those wonderful side dishes your family would keep asking for more. I hope you love this soup as much as I do. 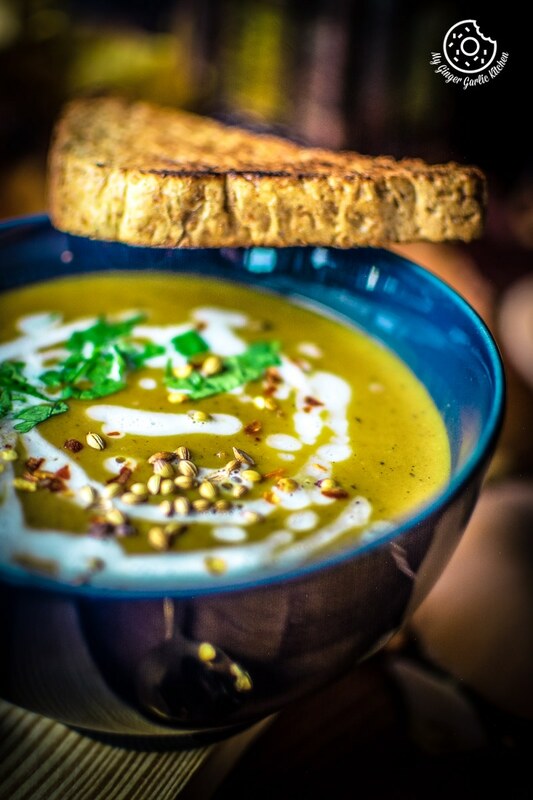 Do let me know how this butternut soup turned out for you in the comments. 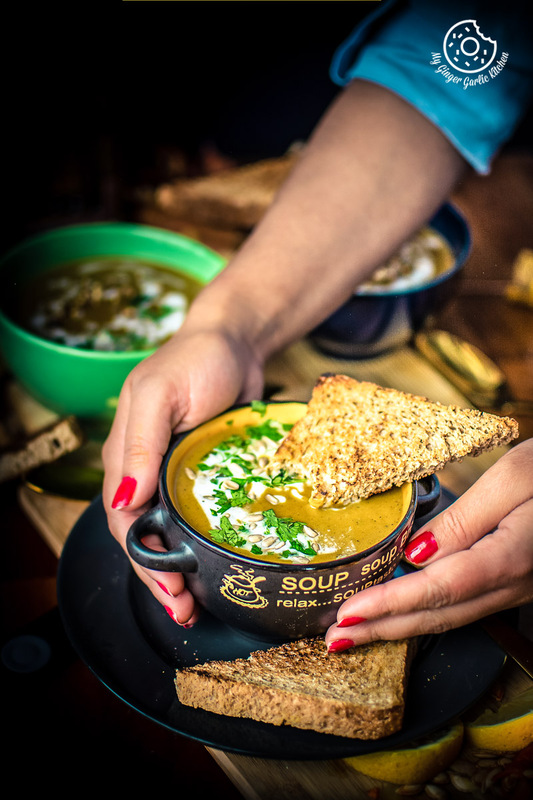 A comfy, rich, creamy, and fall-winter favorite warming bowl of golden butternut squash deep golden soup is as delightful as it looks. 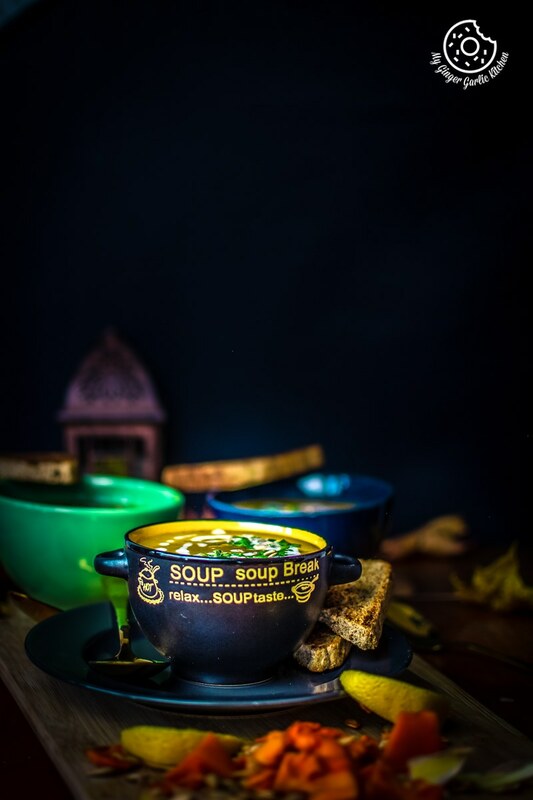 The rich creaminess, the vibrant color, the smooth textures, and yummy flavors, you name it – this soup has everything. 1. Preheat the oven to 400°F/200°C, and arrange a rack in the middle. 2. Add the cubed butternut squash, garlic cloves, salt, pepper, and 1 tbsp oil to an ovenproof pan. 3. Toss everything well, and bake for 45 minutes or until tender and soft. 4. Roast until knife tender, 50 minutes to 1 hour. 5. Meanwhile, heat 2 tbsp olive oil in a pot. 6. Once hot, add minced garlic and sauté for 2 minutes. 7. Now add the chopped onions and sauté for 3 minutes. 8. Add coriander leaves, and sauté for another 3-5 minutes or until golden. 9. Add the cinnamon powder, cayenne pepper, curry powder, cumin powder, and vegetable broth. 10. Bring the soup to boil, add crushed coriander seeds. 11. Stir well and cook for 3-4 minutes. 12. Add in the roasted butternut squash and stir well. 13. Add in coconut milk, mix well. Cook for 3 minutes. 14. Add salt and pepper to taste and stir everything well. 15. Remove the pot from the stove and allow to cool slightly, then puree the soup in a blender or food processor. 16. Return the soup pant back to the stove and reheat gently or cook for 7-8 about minutes on low heat. 17. 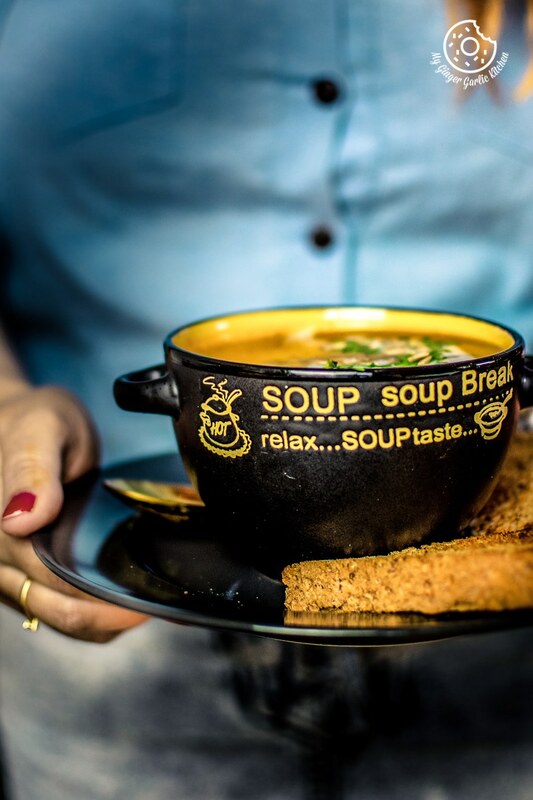 Ladle the soup into a bowl. 18. Drizzle the coconut milk/cream over the soup. 19. Garnish with chopped cilantro, sunflower seeds, and some chili flakes. 20. Serve hot with garlic toasted bread slices. 1. Combine all your soup ingredients except coconut milk in a slow cooker. 2. Cook until tender. It usually takes about 7-8 hours on low, or 3-4 hours on high settings. 3. Add in the coconut milk. 4. Blend it using an immersion blender to puree the soup until smooth. 5. Add extra salt, and/ or pepper if required. 6. Garnish with any of your favorite toppings. 1. Heat olive oil, and sauté onion, garlic, and spices in a large pot. 2. Add spices and vegetable broth. Let it come to a boil add butternut squash, salt, and pepper. 3. Cook it on medium heat until tender. 4. Reduce the heat, cover and simmer for about 30 minutes, or until the butternut squash is tender and can be easily pulped using a fork. 5. Blend it using an immersion blender to puree the soup until smooth. 6. Add extra salt, and/ or pepper if required. 7. Garnish with any of your favorite toppings. 8. Serve with some naan or toasted breadcrumbs. 1. Press sauté mode. Heat oil and sauté onion and garlic. 2. Set the instant pot to pressure cook mode. 3. Add all the butternut squash, vegetable stock, garlic, cilantro, salt, ground black pepper, cayenne, cinnamon and cumin powder to an Instant Pot pressure cooker. 4. Toss to combine, and close lid and pressure cook for 10 minutes. 5. Remove the lid when all the steam has released and the pressure valve has dropped. 6. Stir in the coconut milk. 7. Blend it using an immersion blender to puree the soup until smooth. 8. Add extra salt, and/ or pepper if required. 9. Garnish with any of your favorite toppings. 10. Serve it hot or warm. 1. You can also add some ginger to the soup while sautéeing. 2. For buttery flavor, you can swap olive oil with butter.